11 a.m. to 4 pm. 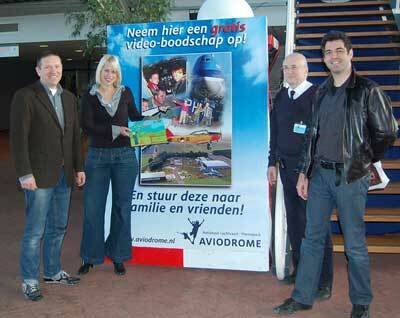 An Operation Manna eye witness / Aviodrome volunteer (second from right) stands with Siebe and Jan of Uphill Battle and friend. 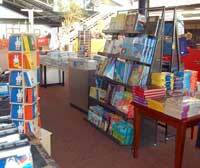 Photos- left to right: Gift shop at the Aviodrome - A Bad Penny Always Comes Back can be seen on one of the book racks. A replica of the old Schiphol terminal building from 1928 was built on the site of the new airport at Lelystad, The Netherlands where the Aviodrome was reopened in 2003. Siebe Huizinga of Uphill Battle in the Aviodrome auditorium where "A Bad Penny always Comes Back" book will be presented April 25/26/09. 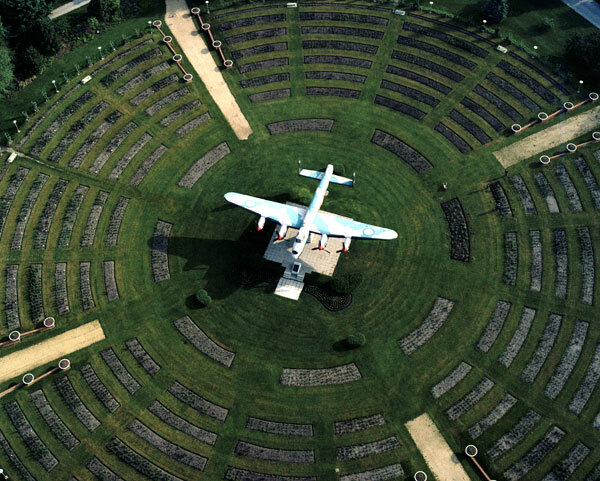 The national aerospace theme park and museum Aviodrome presents the highlights of aviation history, focusing largely on Dutch contributions. Housed in an aluminum dome, the exhibition shows the progress of aviation from the early pioneers through modern times and even anticipated future developments. More than 20 airplanes, engines, numerous models and other objects, such as equipment and documents give visitors an idea as to what flying used to be like. See website for complete list of attractions, event schedule, admission prices and more. 2 groups representing WWII will be present for the Operation Manna anniversary: Green Group (with Dodges, Harleys, tents, etc) and Screaming Ducks representing an Airborne Division. There will also be a Delta Bluesband playing. Glen Mitchell read the book "A Bad Penny Always Comes Back" to students from the Dougall Elementary School at the Windsor Public Library. Click here to see photos from this event. 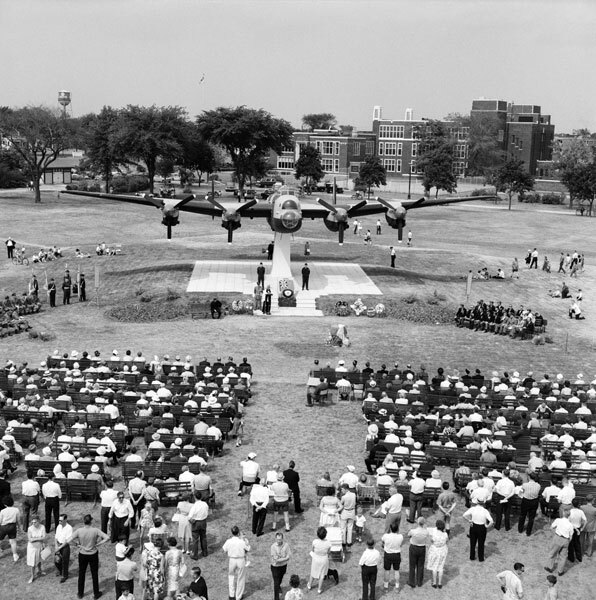 Dedication event at Jackson Park in Windsor on June, 1965. Photos by Spike Bell, M. Photog. MPA. Windsor’s Lancaster, recently christened “Bad Penny” will be towed from Jackson Park from its storage location south along McDougall Road, then south on Howard Avenue to the Sears parking lot at Devonshire Mall. The plane leaves at 6 am and it will take approximately 3 hours to get to the Mall. This is a rare photo opportunity for amateur and professional photographers alike. Bad Penny will be available for tours starting that day. There will also be numerous displays and Glen Mitchell will be on hand to sign his book, “A Bad Penny Always Comes Back,” along with Bad Penny Radio Operator, Stan Jones. The final day of the Sears tour will be Sat. May 12. At 6 am, Sunday, May 13, Bad Penny will be towed to Windsor Airport. After a brief publicity stop at Tim Horton’s (Walker and Highway 42), Bad Penny will proceed to its new home at Windsor Airport. Glen will be reading to the grade 5 & 6 classes from 12 to 12:50 pm and the grade 7 & 8 classes from 12:50 – 1:40 pm. Glen will be reading to the Grade 4 & 5 classes from 10 – 11 am. Glen will discuss how he became interested in the story of Bad Penny and why he decided to write a book about the events on the day of April 29, 1945, despite having no previous writing experience. He will be available to answer questions from the students about the writing and publishing process and how he has been able to begin spreading the story of Bad Penny, her heroic crew and the lessons of Operation Manna to people around the world through his website and hopefully, a tour of Holland. Glen will present to two different classes beginning at 12:27 pm. Glen will be meeting with visiting Dutch students from Apeldoorn (one of Burlington's twin cities and one of the city's which benefited from Operation Manna) and their teachers during the Friendship Day event in Burlington on May 5. Free Parking and No Admission Charge. Flag raising at Burlington City hall at 3 pm. Glen, Bad Penny Operator Stan Jones and Peter Buttenaar, the Dutch boy featured in Glen’s book who waved at Bad Penny on April 29, 1945, will help raise the flag. Stan Jones will say a few words afterwards. The celebration continues at the Royal Botanical Gardens (RBG) in Burlington beginning at 5 pm when the doors open and the public is welcome to tour exhibits set up by Dutch/Canadian vendors and organizations. Welcome and introductions at 6:30PM in the RBG auditorium. Glen Mitchell will be one of the exhibitors and from time to time, will be reading his book “A Bad Penny Always Comes Back” at his booth where it will be available for sale, and he will be reading his book in the auditorium at approximately 6:45. Glen will be signing copies of his book at his booth, along with Stan Jones and Peter Buttenaar. 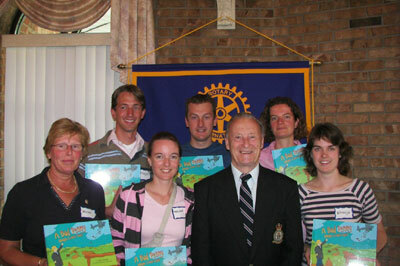 On May 22, six visitors from the Netherlands were guests at a Windsor-Roseland Rotary lunch. Guest speaker was Stan Jones, Bad Penny Wireless Operator, who recounted his experience during Bad Penny’s first flight in to Holland to drop food for the Dutch. Although they had not lived during those desperate days of WWII, the visitors were moved by Stan’s speech, as were the Rotary members, and he was given a standing ovation. The Dutch visitors each received a signed copy of “A Bad Penny Always Comes Back”. Author Glen Mitchell was unable to attend as he was out of the country. In November 2006, Author Glen Mitchell visited The Eagle's Nest at D.M. Eagle School in St. Clair Beach, Ontario to share his story, "A Bad Penny Always Comes Back." 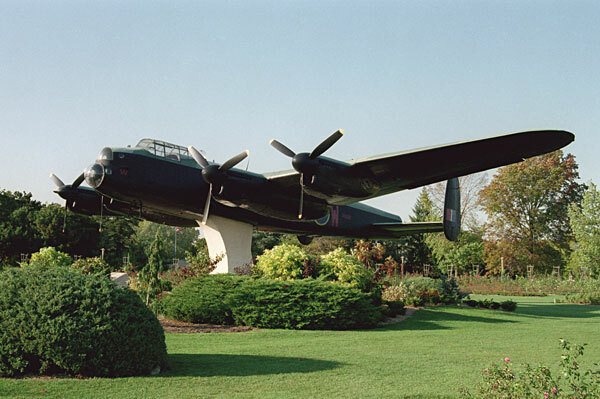 The tale of the Lancaster bomber and its crew and their journey to feed the people of Holland during the Second World War led the children to ask many thoughtful questions. They no longer wonder why Holland sends thousands of tulips to Ottawa each year. They know that the beautiful flowers are a thank you gift to all Canadians for helping their people during the war and an expression of friendship between the two countries. "Each and every flower is a sign of love from all the Dutch children." In this photo, student Kate Morrison gives Glen a thank you gift from D. M. Eagle students, including a donation on his behalf to the A.L.S. Society of Windsor and Essex County. Tom Skinner of Windsor, Ontario purchased 131 copies of the Bad Penny book and donated them to every public and separate elementary school in Windsor and Essex County. The official presentation for the public school donation occurred at Concord School in east Windsor on November 21 after author Glen Mitchell read the book to a group of attentive junior students. Glen and Carmel Mitchell at Concord School. Official book launch of A Bad Penny Always Comes Back.